Seasons greeting to all on farewelling the old and welcoming the new. 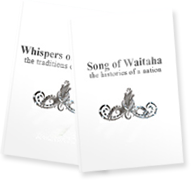 And with that is this news that in fact there are few remaining copies of Song of Waitaha: Histories of a Nation, left. In fact we are down to the last 200. This means as well that the set of Song and Whispers is only possible to purchase while the Song is available. There is no vision to reprint Song in the future. Please advise others of this should you know anyone wanting to purchase Song of Waitaha as a set or individually. Once the word is out that this is the last opportunity to purchase this unique taonga they will go very quickly. You can order the books through the website if you wish. I look forward to hearing from you. I am of the Manning whanau from Arowhenua, & would like to know how to purchase a copy of the above book set for my whanau, if possible. Thankyou.